This study explored the effect of visual feedback on classroom noise levels, using a SoundEar II device that monitors noise levels in real time with feedback on intensity levels using a lighting system. During phase one, noise levels from three classrooms in the same school were measured over 36 h of classroom activities. For phase two, six teachers from two schools completed a questionnaire describing their experiences using the device. Visual feedback resulted in a 1.4-dBA reduction in the average noise levels. Classroom noise levels were above 70 dBA for 33% of the time in the baseline period compared to 24% in the intervention period with visual feedback provided on noise levels. Teacher perceptions indicated that visual feedback was beneficial to classroom noise levels and positively influenced the behaviour of learners. Visual feedback reduced overall classroom noise and can provide a cost-effective, noninvasive tool to create a more enabling classroom environment. Education is the fundamental building block for a strong and independent individual and is the key to sustainable development by supplying learners with critical skills and tools (International Labour Organization 2012). Enabling environments are essential to ensure optimal outcomes for learners within the educational sector. However, South African public schools face numerous challenges, which may negatively influence the learning environment and subsequent performance of learners. According to the Department of Education's 2010 statistics report, on average there are 30 learners per teacher, 480 learners per school and 16 teachers per school. School buildings and classrooms that cannot meet size requirements for the number of students negatively influence the performance, with poorer students being more affected (Earthman 2002:4). Ready, Lee and Welner (2004:1992) indicate that fewer students have been reported to pass reading and mathematics proficiency tests in overcrowded schools possibly because of increased teacher stress and poor classroom facilities. Classroom acoustics is another challenge that may result in an unconducive learning environment for many students (Shield & Dockrell 2003:98) and is something that has been neglected in education circles (Shield & Dockrell 2003:98). This is of particular concern with regards to foundation-phase education because a learner's ability to recognise and understand speech in an adverse listening environment does not mature until teenage years (Johnson 2002:145). Therefore, foundation-phase learners need a more favourable signal-to-noise ratio to fully comprehend verbal communication (Johnson 2002:156). In addition, according to Howard, Munro and Plack (2010:928), multitasking is often required of students within the classroom and includes making notes whilst listening to the teacher and combining the information received. Multitasking becomes difficult in classroom situations where there are adverse listening conditions exceeding recommended levels. Leung and McPherson (2006:288) stated that a good listening environment in schools is critical to cognitive, social, speech and language development. According to Johnson (2002:145), learners must be able to use their listening abilities to provide them with success in learning. Approximately 60% of learning activities in the classroom encompass listening to and participating in verbal communication (Prakash, Rangasayee & Jeethendra 2011:1495; Ramma 2009:115). According to Howard et al. (2010:928), when learners require more effort to listen, they have fewer remaining resources to attend to additional tasks, which may negatively influence the learning experience. Noise makes it difficult for learners to concentrate on lessons by preventing verbal communication and decreasing the learning experiences and problem-solving skills of learners in general (Shield & Dockrell 2008:139). Causes of observed noise pollution in schools are many, including but not limited to the poor acoustic designing of the buildings, failure to use sound-absorbing materials and overcrowded classrooms (Polat & Buluş-Kırıkkaya 2007:79; Tamer-Bayazit, Küçükçifçi & Şan 2011:170). Another complicating factor for creating an enabling learning environment within the South African education context is the prevalence of multilingualism. Learners are often from different linguistic backgrounds than their educational settings. For example, many learners are taught almost exclusively in English and not in their first language during early education (Ramma 2009:119). These learners are at an increased risk of developing learning delays as a result of classroom noise because they rely heavily on the acoustic signal for comprehension instead of previous English linguistic experience to guide them in understanding the message (Nelson et al. 2005:220; Ramma 2009:124). Reducing noise in classrooms is an important strategy to encourage optimal support for academic performance, as well as second language acquisition and comprehension (Ramma 2009:125). A number of interventions to reduce classroom noise levels for enabling classroom environments have been suggested (Adrian & Rathweg-Adrian 2009:5). Installing quiet, ducted heating, ventilation and air conditioning systems along with building schools in areas that are far away from highways and aircraft noise are important construction strategies. Installing quality doors and windows and constructing soundproof walls will also reduce the level of noise coming from the outside, and amplification systems in rooms have also been proposed as a partial solution. However, an amplification system does not solve the problem of reverberation (Nelson, Soli & Seltz 2002:1). Amplification systems solve only part of the problem as they only amplify the teachers' voice but create a problem when the learners want to ask questions in class (Larsen & Blair 2008:451). Noise-level indicators using visual feedback systems have also been suggested to make students and teachers aware of noise levels in the classrooms. These include LED lights that illuminate when noise levels are too high (Prakash et al. 2011:1497). This has been shown to be effective in reducing classroom noise and towards improving the learning environment, although noise influences outside the school cannot be controlled (Nelson et al. 2002:1). In South Africa where learning barriers such as classroom size and receiving education in a language other than a child's primary language are common, emphasis should be placed on the importance of optimising the learning environment by reducing noise levels. Thus far, no studies have been reported in South Africa that use simple visual feedback systems to provide learners with information on optimal noise levels within the classroom. Therefore, the current study investigated the effect of a real-time visual feedback system for noise levels in the classroom in a sample of South African public schools. A two-phase design was followed to evaluate the effect of visual feedback on classroom noise levels. Phase one consisted of a baseline and intervention comparison of classroom noise levels. Phase two consisted of a questionnaire evaluating teacher perception and experiences of the visual feedback intervention of phase one. Ethical clearance to conduct the research study was provided by the Research Committee of the Department of Speech-Language Pathology and Audiology, Faculty of Humanities, University of Pretoria, as well as the Gauteng Department of Education. Additionally, informed consent letters were given to the principals of both schools as well as the six teachers whose classes participated in the study. The main aim of the study was to determine the effect of visual feedback on classroom noise levels (Grade 1-3) when a visual feedback system (SoundEar II, SoundShip aps, UK, http://soundear.com/soundear/) was employed. Two government-funded public primary schools in Tshwane west participated in the study. For phase one, a pilot programme was implemented at the first school to determine the feasibility of the SoundEar II in the school setting and to eliminate the possibility of the device being a distraction in the classroom. As such, the device was mounted on the wall and provided visual feedback to the learners, but did not make any recordings. At the close of the pilot programme, in addition to the visual feedback, noise levels were also recorded at the second school. For phase two, teachers from both schools were asked to complete the questionnaire. During phase one, each classroom had a teacher who taught the children for the duration of the study. The grade 1 classroom consisted of 35 learners, the grade 2 classroom had 40 learners and the grade 3 classroom had 39 learners. During the intervention period, visual feedback on noise was provided by the SoundEar II for the teacher and pupils to keep track of classroom noise levels. Classroom noise levels were measured during the baseline and the intervention periods. Once the intervention period was completed, the questionnaire phase was conducted. Six female teachers, between the ages of 26 and 60, from the two schools were asked to complete a questionnaire relating to their experience with the SoundEar II device and the effectiveness of the intervention. 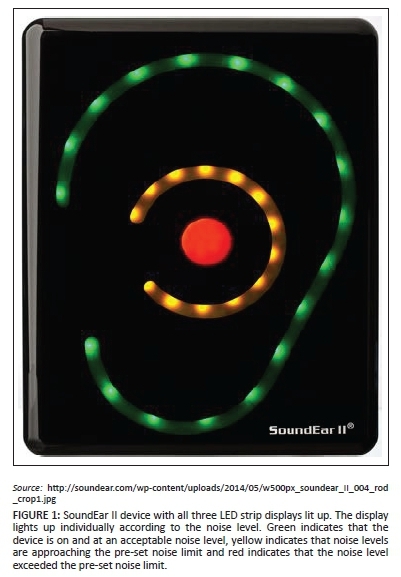 During phase one, The SoundEar II device (Figure 1) was used to indicate the level of noise in the classroom to the learners in real time. The device noise level was pre-set on the back of the device to a noise limit of 80 dBA, using the dB dial. The noise limits available ranged from 40 dBA to 115 dBA and could be changed at any stage. Once plugged into the power supply, the device showed three different LED displays according to the noise level in the classroom. A green display indicated that the noise level was appropriate and below the pre-set noise limit. A yellow display indicated that the noise level was approaching the pre-set noise limit and precautions should be taken to reduce the noise level. A red display indicated that the noise level had exceeded the pre-set noise limit and notified the teacher and the learners that active steps should be taken to reduce the level of noise. During the intervention period, visual feedback was provided to the teachers and learners to keep track of the classroom noise levels. The SoundLog device was used to capture the daily noise levels within the classroom by recording and storing the noise-level measurements. Devices measured noise levels and automatically collected and stored the data. The data were then loaded onto a computer, by means of a USB storage key, for analysis through the SoundLog software. During phase two, once the devices were removed from the classrooms, the six teachers from the two schools were asked to complete a questionnaire in which they described their personal experience with the SoundEar II device and the effectiveness of the intervention. Their responses were then analysed thematically and compared to the data obtained through the SoundLog software. The SoundEar II device was mounted on the wall in the front of classroom to provide visual feedback to learners. Each of the classrooms varied in size, acoustic properties and number of students (Table 1). The baseline recording period noise levels were measured over a period of 6 days on which the learners spent the full day in the classroom. Days when learners spend periods outside or doing sport activities were not considered. This recording took place in three classrooms from one school. During this phase, the SoundEar II device was covered and teachers were instructed to ignore it. The SoundLog device measured noise levels in the classroom over this period without visual feedback to the learners. For this week we are going to be using this device [teacher shows the children the device]. It will be listening to how much noise is in the class. When the light is green it means you are being quiet. When the light turns orange it means we must be careful because we are a little too loud. When the light turns red it means we must all keep quiet because it is too loud in the class. Directly after phase one, teachers were requested to complete a five-part questionnaire evaluating teachers' perceptions and experiences of the visual feedback intervention of phase one. The SoundLog software for data collection and analysis was included with the SoundEar II and was installed on a computer. The programme downloaded the noise measurements from the SoundEar and displayed them graphically. The data were then exported for analysis into an Excel spreadsheet. Data analysis consisted of determining noise-level averages, standard deviations and maximum and minimum levels in the baseline and intervention phases. To determine if noise levels were statistically significant, the independent-samples t-test was used with significance set at 1%. For phase two, questionnaire responses were thematically analysed. Three classrooms were used to determine the effect of visual feedback on classroom noise levels (Table 1). Each of the classrooms varied in size, acoustic properties and the number of students. Distribution of recorded noise levels during the baseline and intervention periods of the study (Table 2) indicated a higher maximum noise level (98.0 dBA) during the baseline period of the study as opposed to the intervention period (94.1 dBA). Average noise over the recording duration was 68 dBA during the baseline recording period and 66.6 dBA during the intervention period (Table 2). Noise levels exceeded 70 dBA during the baseline period 32.8% of the time, whilst during the intervention period, it exceeded only 24.3%. Noise levels exceeded 80 dBA during the baseline period 7.5% of the time, whilst during the intervention period, it exceeded only 5.1%. Noise levels exceeded 90 dBA during the baseline period 0.4% of the time, whilst during the intervention period, it exceeded only 0.2% (Figure 2). 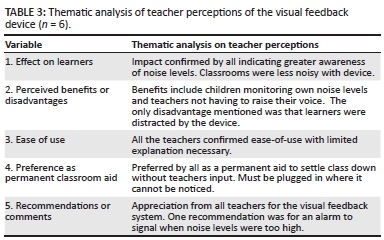 The thematic analysis of teachers' perceptions of visual feedback in their classrooms is summarised in Table 3. Teachers generally agreed that the visual feedback on noise levels had a discernible influence on the behaviour of the learners, which included reports of increased awareness of sound levels and being attentive to keeping noise levels low. Most teachers reported only benefits of the visual feedback device, including learners being able to keep classroom noise to a minimum without constant reminders, settling down faster, using softer voices in the classrooms and allowing the teacher to monitor her own voice loudness during lessons. One teacher reported that a disadvantage of the visual feedback device was that the learners were distracted by the device and lost interest to cooperate with the device after they had become used to it. All teachers found the SoundEar II device easy to use, and they were enthusiastic about having it as a permanent classroom aid. There was general consensus that they enjoyed having the visual feedback device in their classrooms. One teacher recommended that the device be fitted with an alarm that sounds when the visual display turns red as a result of high noise levels. The classroom environment has a direct effect on how learners learn. It is generally accepted that noise has a detrimental effect upon the learning and attainments of primary school children (Leung & McPherson 2006:288; Shield & Dockrell 2003:99). In addition to appropriate room temperature, comfortable seating and adequate lighting, it is essential that classrooms have an acceptable noise level. There are also groups of children for whom understanding their teachers and their peers can be particularly difficult in the classroom, for example, children who are not being taught in their first language (Nelson 2003:23), children with disorders such as attention deficit/hyperactivity disorder (Breier & Gray 2002:28) and children with speech and language difficulties. These children may be easily distracted in poor acoustic conditions or may have general problems in processing language, which will be exacerbated in classrooms with poor acoustics. Acoustical adaptations to improve the learning environment include physical modifications (such as acoustical ceiling tiles and carpeting), reducing the distance between student and teacher, controlling ambient noise, use of individual amplification systems for at-risk learners and the use of sound field amplification (Berg, Blair & Benson 1996:18; Crandell & Smaldino 1999:43). Average noise over the recording duration in this study was 68 dBA during the baseline recording period and 66.6 dBA during the intervention recording period. Tamer-Bayazıt et al. (2011:175) carried out a study investigating noise annoyance in elementary schools. Equivalent noise levels in these schools ranged between 51 and 83.3 dBA and was 72.5 dBA on average. Choi and McPherson (2005:349) studied noise levels in Hong Kong primary schools to obtain ambient noise levels and its relationship to the speech intensity levels of both students and teachers in 47 primary school classrooms. In their survey, they found that the mean occupied classroom noise level was 60.74 dBA. A study by Bulunuz (2014:218) determined the noise pollution levels in Turkish elementary schools and investigated noise-level awareness and sensitivity training. A seminar was conducted for teachers and students to educate them about the effects of noise. In this study, no change occurred in the values obtained before and after implementation of their intervention phase. Prakash et al. (2011:1498) also used a visual feedback system for facilitating the learning environment of school-going learners with hearing disability. This study found noise levels of five different classrooms to range from 55.5 dBA to 70.4 dBA in an unoccupied classroom and from 61 dBA to 80.7 dBA in an occupied classroom. The responses and feedback they obtained through questionnaires regarding the use and efficiency of a visual feedback device were very positive and indicated improvement in the learning environment. In phase two of this study, questionnaires evaluating teacher perception and experiences of the visual feedback intervention of phase one were given to the participating teachers. Teacher perception regarding the use of the visual feedback device was generally very positive, and it was generally reported that the students responded very well to the device and monitored their noise levels by using the visual feedback presented to them. Findings from the present study as well as from previous studies mentioned above indicate that noise levels in the classrooms typically exceed suggested standards set by the American Speech Language-Hearing Association (ASHA 2005). Standards set by the association suggest that the most appropriate noise levels for learning should be in the 30- to 40-dB range for an empty classroom and not exceed 50 dB for a classroom containing students. 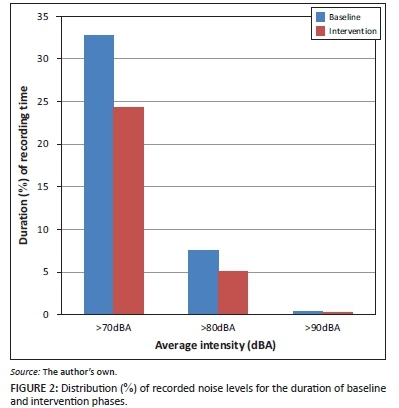 Findings indicate average noise results over the recording duration that was 68 dBA during the baseline recording phase and 66.6 dBA during the intervention phase as well as maximum noise levels of 98.0 dBA during the baseline phase of the study as opposed to the intervention phase (94.1 dBA). The visual feedback system resulted in a significant reduction in the average level of noise across classrooms. Constant visual feedback allowed teachers and learners to control the level of noise within the classrooms more effectively. According to Earthman (2002:7), students in classrooms with less noise are able to do better in mathematics and have better reading skills. Exposure to high noise levels has been associated with poor long-term memory, poor reading comprehension and decreased motivation in school learners (Dockrell & Shield 2006:136). The ability to hear clearly and understand what is being said is very important for learners to learn effectively (Earthman 2002:7). Excessive noise in a classroom context can distract and annoy both learners and teachers (Dockrell & Shield 2006:133), which can disrupt learning. Therefore, visual feedback of noise levels as shown in this study may serve to reduce the academic barrier posed by classroom noise. Reduced noise levels during the intervention period compared to the baseline period may allow teachers to reduce classroom noise levels for teaching in less adversarial noise environments using a more natural voice with less vocal stress (Nelson et al. 2002:2). Lower noise levels make it easier for learners, especially those in the foundation phase (grade 1-3), to hear the subtle differences in words when they are learning to read (Anderson 2003:77). Therefore, devices such as the SoundEar II may be used as a tool for noise management to facilitate a more enabling learning environment. Visual feedback devices could possibly be a low-cost way of reducing classroom noise when compared to the cost of acoustically treated classrooms. Visual feedback on noise levels may serve as a way to raise awareness in learners and teachers about the importance of appropriate noise levels for an enabling learning environment. Other suggested ways of reducing classroom noise levels are the installation of quality doors and windows and soundproof walls, which will also reduce the level of noise coming from the outside (Crandell & Smaldino 1999:38). Amplification systems have also been suggested as a solution for giving a more favourable signal-to-noise ratio (Nelson et al. 2002:3). Amplification systems contribute to a better learning environment but only amplify the teachers' voice. This creates a problem when the learners want to ask questions in class (Larsen & Blair 2008:453). Noise-level measurements in this study were carried out in a single semester. A longer term measurement period would have provided a more representative average noise level and subsequently been useful in evaluating the effect of introducing a visual feedback intervention. Another limitation was that only two schools participated in this study. A larger sample of schools would provide a more generalizable sample of typical classroom noise in South Africa. Visual noise feedback provided significantly reduced classroom noise levels. Self-reported feedback from teachers indicates that visual feedback improves the teaching experience and classroom environment. In South Africa, where learners face numerous barriers to learning, such as multilingual environments, large numbers of learners and poor acoustical treatment, a visual feedback system may ensure improved learning environments. All authors were involved in the planning and writing of the research project. The first three authors were also involved in data collection. Anderson, K., 2003, 'Voicing concerns about noisy classrooms', Association for Supervision and Curriculum Development 77-79.
International Labour Organization, 2012, Right beginnings: Education and educators in early childhood, Report on the debate in the global dialogue forum on the conditions of personnel in early childhood education. February 2012, Geneva. Nelson, P., Soli, S. & Seltz, A., 2002, 'Classroom acoustics II: Acoustical barriers to learning', Technical Committee on Speech Communication of the Acoustical Society of America, 1-12.